↑ The Substantive Law of the EU: The four freedoms (2 ed.). Oxford University Press. পৃষ্ঠা. 447. ISBN ISBN 978-0-19-929035-2.. https://en.wikipedia.org/wiki/European_Union#cite_note-Four_Freedoms-1. ↑ Cybriwsky, Roman Adrian (2013). Capital Cities around the World: An Encyclopedia of Geography, History, and Culture: An Encyclopedia of Geography, History, and Culture. ABC-CLIO. https://books.google.com/books?id=qb6NAQAAQBAJ&pg=PA64. "Brussels, the capital of Belgium, is considered to be the de facto capital of the EU"
↑ Current Article 1 of the Treaty on European Union reads:"The Union shall be founded on the present Treaty and on the Treaty on the Functioning of the European Union. Those two Treaties shall have the same legal value. The Union shall replace and succeed the European Community". ↑ "Eurostat - Population on 1 January 2015". European Commission. http://ec.europa.eu/eurostat/tgm/table.do?tab=table&language=en&pcode=tps00001&tableSelection=1&footnotes=yes&labeling=labels&plugin=1। আহৰণ কৰা হৈছে: 20 August 2015. ↑ "Basic information on the European Union". European Union. europa.eu. http://europa.eu/about-eu/basic-information/index_en.htm। আহৰণ কৰা হৈছে: 4 October 2012. ↑ "European Union". Encyclopædia Britannica. http://www.britannica.com/EBchecked/topic/196399/European-Union। আহৰণ কৰা হৈছে: 3 July 2013. 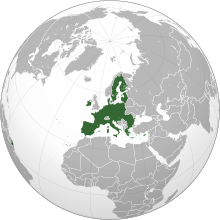 "international organisation comprising 28 European countries and governing common economic, social, and security policies ..."
↑ "European Union". The World Factbook. Central Intelligence Agency. https://www.cia.gov/library/publications/the-world-factbook/geos/ee.html। আহৰণ কৰা হৈছে: 11 October 2009. ↑ "Schengen area". Europa web portal. http://ec.europa.eu/home-affairs/policies/borders/borders_schengen_en.htm। আহৰণ কৰা হৈছে: 8 September 2010. ↑ European Commission. "The EU Single Market: Fewer barriers, more opportunities". Europa web portal. http://ec.europa.eu/internal_market/index_en.htm। আহৰণ কৰা হৈছে: 27 September 2007. "Activities of the European Union: Internal Market". Europa web portal. http://europa.eu/pol/singl/index_en.htm। আহৰণ কৰা হৈছে: 29 June 2007. ↑ "Common commercial policy". Europa Glossary. Europa web portal. http://europa.eu/scadplus/glossary/commercial_policy_en.htm। আহৰণ কৰা হৈছে: 6 September 2008. ↑ "Agriculture and Fisheries Council". The Council of the European Union. http://www.consilium.europa.eu/policies/council-configurations/agriculture-and-fisheries। আহৰণ কৰা হৈছে: 3 June 2013. ↑ "Regional Policy Inforegio". Europa web portal. http://ec.europa.eu/regional_policy/index_en.cfm। আহৰণ কৰা হৈছে: 3 June 2013. ↑ Craig, Paul; Grainne De Burca; P. P. Craig (2007). EU Law: Text, Cases and Materials (4th সম্পাদনা). প্ৰকাশক Oxford: Oxford University Press. পৃষ্ঠা. 15. ISBN 978-0-19-927389-8. ; "Treaty of Maastricht on European Union". Activities of the European Union. Europa web portal. http://europa.eu/legislation_summaries/economic_and_monetary_affairs/institutional_and_economic_framework/treaties_maastricht_en.htm। আহৰণ কৰা হৈছে: 20 October 2007. ↑ "EU collects Nobel Peace Prize in Oslo". British Broadcasting Corporation. 10 December 2012. http://www.bbc.co.uk/news/world-europe-20664167। আহৰণ কৰা হৈছে: 3 June 2013.